India is a country with an ancient clothing design tradition, yet it is still emerging in the fashion world. The late 80s and the 90s saw a spurt of growth in the Indian fashion industry. This growth was due to the increasing exposure to global fashion and the economic boom after the economic liberalisation of the Indian economy in 1990. Lately, Indo-Western clothing has been doing the rounds in India. This dressing style is the fusion of Western and South Asian fashion. 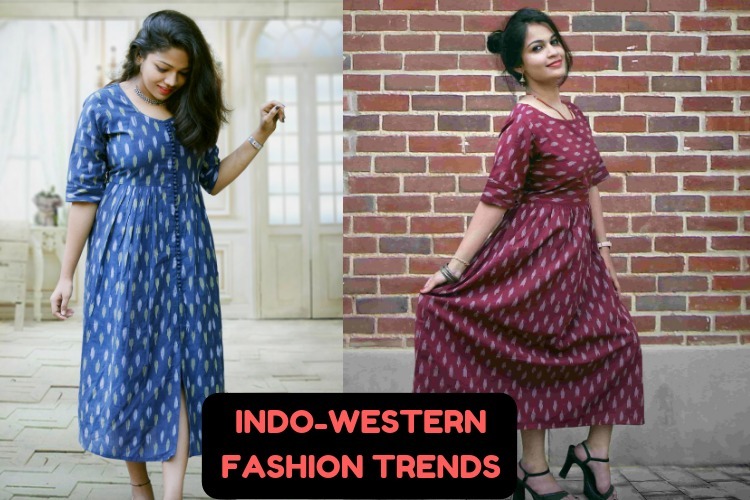 During the 21st century, Western styles were well established as part of Indian fashion, where some working Indian women ditched traditional saris for Western-style dresses. Today’s youth is enthusiastic in combining traditional clothes with a western touch. Older women still tend to don the traditional salwar kameez or saris, however, some women, particularly those of the younger generation, choose Indo-Western clothing for work and festive occasions. The clothing of the quintessential Indo-Western ensemble consists of the trouser suit, which is a short kurta with straight pants and a dupatta. Newer designs often feature sleeveless tops, short dupattas, and pants with slits. As designers compete to produce designs in tune with current trends, new fusion fashions trends are emerging rapidly. The traditional salwar has long or short sleeves. An Indo-Western design might not sleeves altogether, or replace the sleeves with spaghetti straps, resembling the style of a tank top or halter. There are also poncho-styled tops and one-sleeve designs that follow contemporary Western trends. Indo-Western kurtas and salwars tend to be much shorter than those traditionally worn, so that they resemble Western-style blouses. Some Indo-Western tops are available with plunging necklines, in contrast to the traditional styling of salwars and kurtas. Maintaining the same fashion trend, Qyaari has fabricated exquisite range of Indo-Western styles, crafted seamlessly from its unique collection of fabrics. In addition to keeping with “Make in India” theme, the fabrics are very comfortable on the skin, environmental friendly and good for the Indian climate.